The Big Bend Branch of the American Public Works Association Scholarship Program is designed to assist those individuals who are pursuing a career in the public works field. Encompassing disciplines from engineering, public administration, or continuing education for career enhancement of public agency employees is the philosophy of the Association. This assistance in education promotes and ensures a continuation of the high level of skill, talent, and professionalism that is the pride of every member. For more than one hundred years, the American Public Works Association (APWA) and its Chapters traditionally strive for the advancement and continued development of all of the various components that make up the public works family. It is incumbent upon the membership of the Big Bend Branch to lend a helping hand to those who have chosen the public works field as their career. The Scholarship Program is an integral part of achieving this goal. 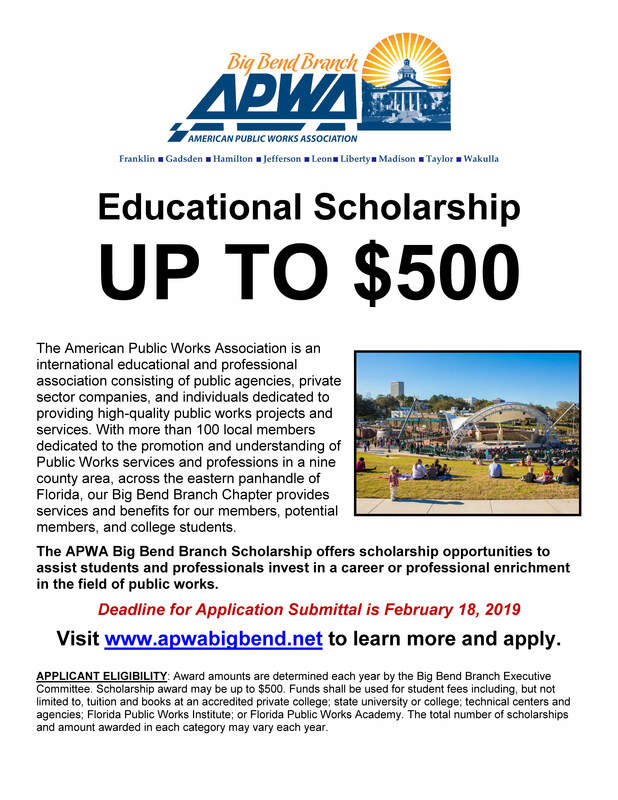 In addition to traditional college or university scholarships, the APWA Big Bend Branch MAY award scholarships to individuals that are enrolled or have recently attended the Florida Public Works Institute or a Public Works Academy programs. The Florida Public Works Institute program and Public Works Academies provide leadership, management and operational training for public works employees who are looking to enhance their skills and advance their careers by developing an emphasis in real-world situations. Here is your link to the Application Criteria and Application Form.